With the rise of walled garden listing sites, it's become important to be able to customize inquiry responses depending on which site the inquiry came from. Some regional sites still include guest email addresses so you can send quotes directly from OwnerRez -- see our list of Regional Listing Sites. Most national sites like VRBO/HomeAway, FlipKey/TripAdvisor, Airbnb etc. have removed guest contact info until after booking, so you don't want to autorespond to them, or want to send a simple "we got your inquiry and will answer in the listing site" email. To address this, we've moved Autoresponders to settings and added criteria for Property, Listing Site, and Time of Day. Any existing Autoresponders on your properties have been converted to the new Autoresponders section in Settings. 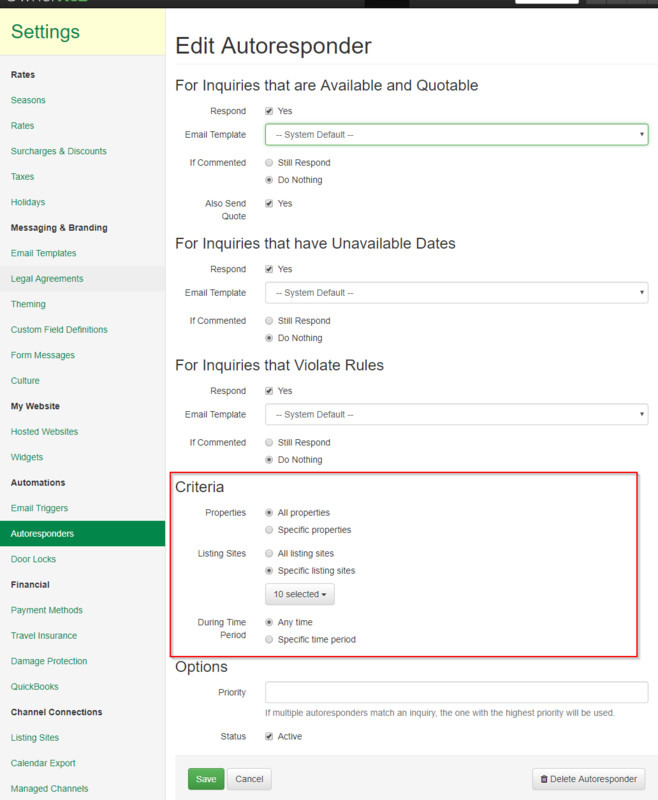 Listing Site criteria allows you to run an Autoresponder for only a subset of sites. If you have multiple autoresponders, only one will be chosen to respond, based on the priority you set. The During Time Period criteria allows you to make Autoresponders that only run during a certain time of day. For example, maybe you want to respond directly during the day, no autoresponder, so that you can give that personal touch. But you might have an Autoresponder running in off hours, overnight, letting guests know that you will respond in the morning, so they get immediate feedback. While we were at it, we also reworked the Settings categories to move related items together. Everything that was in Settings is still there, but if you don't find the link you're looking for in the old section, look through the page in other sections.